To say I had no idea about taking care of a baby when my first daughter was born is putting it mildly. I had no idea what to expect! Thank goodness my mom was there to show me the ropes or I’d have probably never made it through those first few weeks. I laugh now when I think back about how new the whole experience was to me. For instance, I didn’t realize that baby’s didn’t sleep through the night. Yep. I’m serious. I also didn’t realize how smelly my baby was. The diaper situation was…well, not quite what I expected! 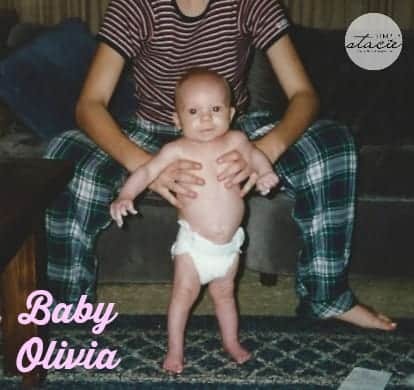 Olivia was born 16 years ago this July. I was a young mom and her dad was in the military. He was shipped off to Bosnia on a tour four days after she was born. He missed the first few months of her life, but I tried to fill him through letters and by chatting on the phone. I remember one time we were talking on the phone and out of nowhwere, I heard this loud rumble coming from Olivia’s crib in her room. She had passed gas so loudly that my husband heard it from overseas (on the phone, of course!). In a shocked accusatory tone, he asked me if that was me. I told him absolutely not and that it was his week old daughter farting like a grown man! I laughed and said I guess we know who she takes after. That story still makes me laugh. I think it was just hearing the shock in my husband’s voice that his little precious girl could do something so stinky. When he got back from his tour overseas, he learned quickly! 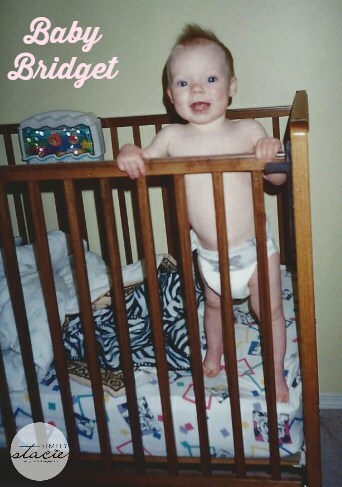 Bridget was my little stinker. That girl could have probably broken the world record for diaper explosions! When she went, she really went and it was everywhere! I remember once when she was a toddler and I was out for an evening at friend’s place. The babysitter called me in a panic and said I had to come home immediately. I was only down the road so I ran home and went to check in on her right away. Thankfully, she was ok. Her room, on the other hand, wasn’t. There was poop splattered all over the wall and crib. I don’t know if she had another diaper explosion of poo or if she was “fingerpainting” from her diaper. Either way it was nasty! The smell was out of this world. I took care of her first and put her in the bath to clean her up and give her a fresh diaper and clothes. Cleaning up the wall in her room was one of the grossest things I’ve had to do as a mom. I did it though, gagging my way through. That experience was the worst diaper explosion I’ve ever experienced! I had a Diaper Genie back then for both my girls. It was an absolute MUST! Someone bought me one for my baby shower for Olivia. For Bridget, I went to Walmart and bought one myself. I knew how well they worked to keep the stink away. There’s been some new innovations since my girls were babies. Elizabeth recently tried the new Diaper Genie Carbon Filters with her baby and toddler who are both in diapers! She describes it as a “wonderful solution to odours in the nursery and beyond”. If by some miracle, I were to ever get pregnant again, there’s no question that I’d be buying another Diaper Genie for my nursery. It may not stop the diaper explosions, but it sure helps to control the smell! If you have any funny (or scary!) diaper stories, please share. I’d love to hear about your experiences. Connect with Playtex Mommyville on Facebook. That’s funny, but I’m sure it wasn’t funny at the time 🙂 What a good way to explain the great need for a Diaper Genie! That was a great story, but I don’t know if I’d be able to clean the walls, there would be more of mess lol. but my daughter when she was a toddler loved pooping in the bathtub, now that was just down right gross, the joys us mothers go through, but they make for good story telling later on!! I think she was probably finger painting if you had to clean up that much. I have no funny diaper stories , although both my sons were colicky and would burp up smelly messes without notice. Cute, I had a boy baby and had never been around boy babies. I had a lot to learn like the first time he peed on me yes boy babie pee straight up and you have to cover that thing. Like I said I learned a lot. I knew that you had to be careful of that with boys lol. My mom helped me out a lot too with my first child. I’m still asking her questions and I have two children now. My first was so easy to care for and I never had any crazy diaper issues with her, but i did have issues with my son. One time I walked into this room after he woke from his daily nap. He had taken his diaper off and when I walked in to get him I saw poop all over the place. He had decided to “paint” his crib and walls with this poop. I still have nightmares about it. My husband wasn’t home to help me, somehow I got it all cleaned up but it was nasty. I think I even stepped on some. Oh, and poop up the back is the worst. I once had to cut him out of a onesise he was wearing. It always amazes me how smelly someone so small can be! I never had a diaper gene per say.. I just made my husband dump the diapers each day lol. I may try cloth diapers for the next go around – the concept isn’t so bad to me now that I’ve dealt with my share of explosions as well. No kids so no stories. I had a hard time just baby sitting doing the diapers. I remember car seats and snowsuits were the worst! Always a huge mess and chore! Potty training is coming up this summer, give me time, I know “something crazy” is gonna happen. This sure brings back memories. I remember many diaper explosions during my kids diaper years. For some reason it always seemed to happen when you were out somewhere in a store or a restaurant which made it really embarrassing as well.